There are a lot of gorgeous women in Hollywood. But Scarlett has a fantastic girl next door look that will leave you speechless and naked on the corner because you blindly gave her everything you own. Yes I think she is that hot. Unfortunately she stars in the just released movie “The Spirit” which is one of the worst movies I’ve ever seen. (click here for my review) So bad that it probably gave me testicular cancer. After seeing the following pictures Miss Johansson has definitely been forgiven for her crimes against humanity. It’s cold being naked. ← The Spirit: Your five year old nephew could make a better film. 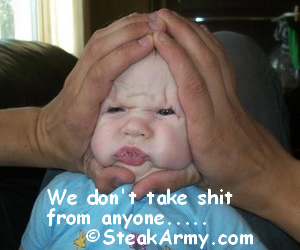 © 2009 Steak Army. Powered by pure unadulterated "Testosterone"